SCUBA QUIZ: What is Decompression Illness? - Dive o'clock! 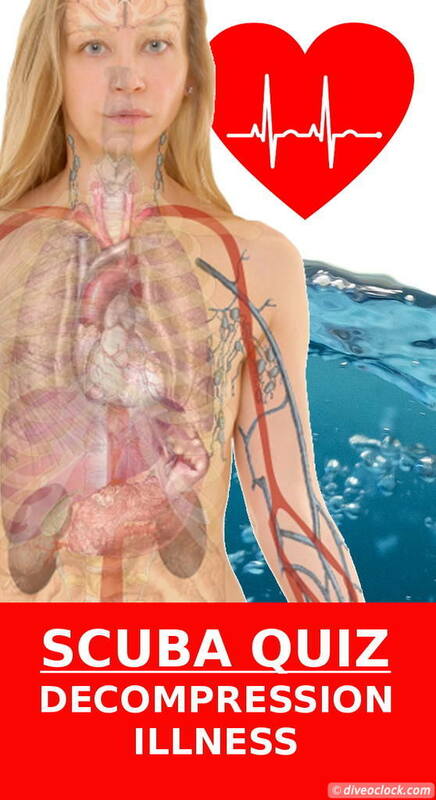 Decompression sickness (also called the bends or caisson disease) is thought to result from bubbles growing in tissue and causing local damage. During a dive, the body tissues absorb nitrogen from the breathing gas in proportion to the surrounding pressure. If the pressure is reduced too quickly, however, the nitrogen comes out of solution and forms bubbles in the tissues and bloodstream. This commonly occurs as a result of violating or approaching too closely the diving table limits, but it can also occur even when accepted guidelines have been followed. Arterial gas embolism results from bubbles entering the lung circulation, traveling through the arteries and causing tissue damage at a distance by blocking blood flow at the small vessel level. If a diver surfaces without exhaling, air trapped in the lungs expands with ascent and may rupture lung tissue - called pulmonary barotrauma - which releases gas bubbles into the arterial circulation. Rapid ascents are closely linked to the risk of arterial gas embolism. Since decompression illness is a random event, almost any dive profile can result in decompression illness, no matter how safe it seems. Because of this, evaluation of a diver for possible decompression illness must be made on a case-by-case basis by evaluating the diver's signs and symptoms and not just based on the dive profile. The kit comes with 100 essential basic life-saving items while weighing only 1 pound. The bag is water resistant and all inner items are protected from water in durable laminate pouches. 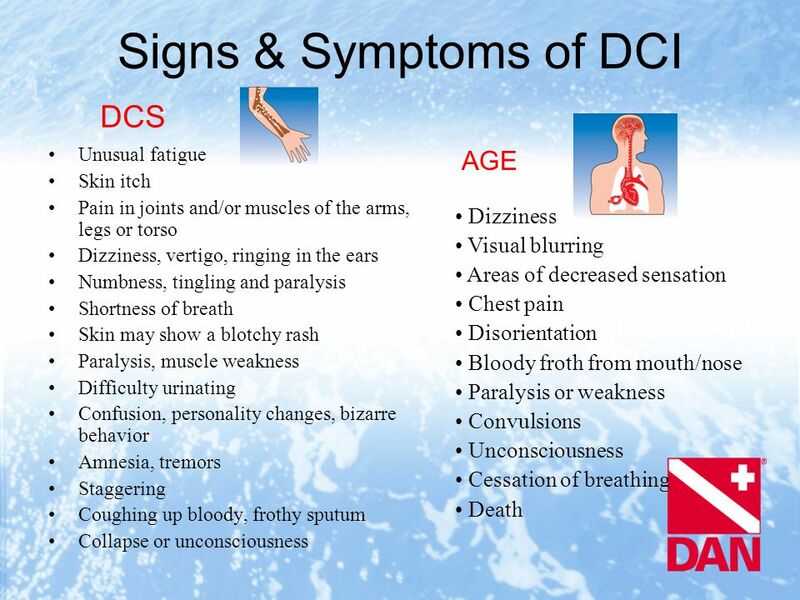 Are these signs and symptoms related to DCS or AGE? The treatment for decompression illness is recompression. However, the early management of air embolism and decompression sickness is the same. Although a diver with severe DCS or an air embolism requires urgent recompression for definitive treatment, it is essential that he be stabilized at the nearest medical facility before transportation to a chamber. Early oxygen first aid is important and may reduce symptoms substantially, but this should not change the treatment plan. Symptoms of air embolism and serious decompression sickness often clear after initial oxygen breathing, but they may reappear later. Because of this, always contact DAN or a dive physician in cases of suspected decompression illness - even if the symptoms and signs appear to have resolved. Visit the related webpage of DAN for more information. How many did you got right? Comment below!